When you are in a garden, stop to smell the Orchids. I had not seen a Rose all day at Fairchild Gardens, that isn't their thing. Not exotic enough. While I do have a Rose in the backyard, and it needs trimming, I have more orchids back there than that. Besides, Roses will grow in every State of the Union, Orchids are much more fussy than that. The name I gave this picture is fairly bland, I don't know the sort of flowers that were growing against the trunk of that tree, but that is part of the charm of the place I guess. There's so much going on that the Orchids are merely commonplace. 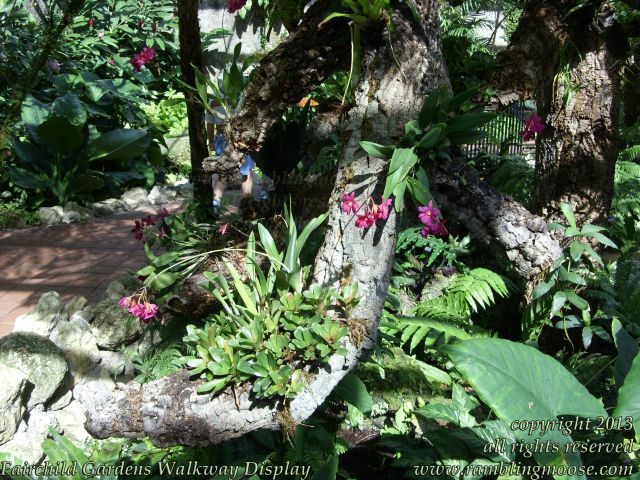 By the way, most Orchids don't have a scent. The ones in my yard don't, although I have my eyes open for a Vanilla Orchid and they do have a fragrance. Beautiful white flowers on a Vanilla Orchid. Definitely not native species, but still quite nice to see.